← HBS talents – more than just brainpower!?! Most RCs look at the ECs as the ones having the easy lives. HBS seems to be less controlling of their schedules, and they just look so much more (choose for yourself) – cool / relaxed / mature / tanned. As an RC, you just can’t wait to become an EC yourself to enjoy some of the EC perks, which include things like flexible class schedules and being rid of high-workload sessions such as FIELD (find more info on FIELD HERE). But let’s assess things on a deeper level. Find my own personal and subjective comparison of the RC and EC year at HBS below. In the first year at HBS, students are being grouped in sections of 90 people – all classes will be taught within that same group. This also means that students will spend the whole year in the same classroom AND the same seat (seat is being changed only once a year). The second year at HBS is very different – students choose their own courses and are thus not following classes within that same section anymore. They move around from one classroom to another and are grouped with students from different sections. One tricky thing here – don’t forget to take your name-card from one room to another! Overall, the RC section feel is so unique… I have no choice but to give my first point to the RC-year! RCs look for summer internships, ECs look for full-time jobs! One can quickly understand that this second activity tends to be much more stressful than the first one. Find out more about recruiting at HBS HERE. An extra half a point for RC-year! With an average of 50% of grades being allocated based on class participation at HBS, there is still another 50% of the grade that gets influenced through something else. In RC year, most courses require completing an exam at the end of the semester. In EC year, most courses tend to require writing one or more (final) papers. Personally, I prefer taking exams – a 4-hour exam is just so much less time-consuming than writing a 12-page paper! RC year gets just half a point for this, as I do like the flexibility in time management of writing papers. As mentioned, the RC year is fixed for everyone – no choice here! In the second year, these things tend to change, as students get the opportunity to choose their own courses. And more importantly, every course is being taught at different times, so that people who tend to be a wreck in the morning can try and avoid these nasty 8.30AM classes! Find more info on EC class selection HERE! EC year 1 point!!! 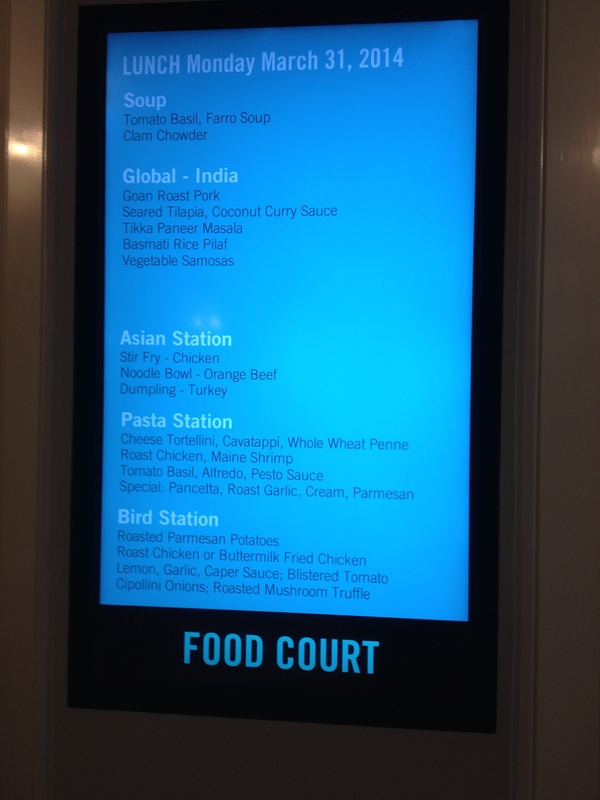 Today’s menu at HBS – how long will you have to wait in line for? So, here’s a math question: how long will you have to wait in line for lunch knowing that 900 RC-students all finish their morning program at 12.10 sharp? And how much time could you save in queuing during EC-year when students are having more flexible programs with a variety of different class times? Yep, the best thing about being an EC is not having to wait in line for food! EC one point! Your first year at HBS can be a confusing an stressful experience. But no worries, HBS makes sure that each section has a leadership team in place to take care of the lost ones. Early in the first year, students will vote on fellow student mates taking on different leadership roles in the section. There is a section president, a sports coach, two social chairs, the section CFO (who will eagerly collect the section dues) and much, much more. But most importantly, each section will also have an Educational Responsible who sends out reminder mails of important tasks to keep track of. In EC year, you’re on your own! Another point for RC! As everything in RC-year is very much so controlled by HBS and the focus is being put on the section-experience and the section-feel, no outsiders are allowed in class – except for the occasional visitors (read more on HBS class visitors HERE). In EC-year, HBS allows cross-registrants in class from different nearby schools, mostly from the Harvard Kennedy School and the Harvard Law School, but also from MIT and other schools in the Boston area. Others are part of leadership programs within Harvard, where people with successful careers come and sit in on certain classes (these people include former Goldman Sachs partners, VC-leaders from the valley, etc). As cross-registrants aren’t always used to some of the HBS specificities and rules in the classrooms, they tend to quickly stand out during class. Find an ‘ode’ to the HBS cross-registrant HERE and HERE. But as far as I am concerned, I love to hear from these people in our HBS classes, as they tend to bring different views and insights. EC-year, one final point! So we got ourselves a 3-3 tie between RC and EC year. Both experiences are impossible to compare. The ‘quality of life’ in each of these years also depend on each one’s personal situation. So the real answer here is that both HBS years are great, and if admitted at HBS, you’ll get to experience them both anyway! Enjoy! This entry was posted in The HBS experience and tagged class selection, comparison, cross-registrant, EC, EC vs RC, electives, exam, FIELD, grading, HBS, HBS cross-registrant, HBS lunch, lunch, lunch at HBS, paper, RC, recruiting, section, section leadership, section president, Spangler, summer internship. Bookmark the permalink.